Musical Connections presents Golden Fingers, featuring Duo AleAnya (Anya Grokhovski and Alena Gorina), the last in our 2017-18 Masters Music Concert Series, thirteen concerts that combine classical music with multicultural performances. The last in this year’s concert series, featuring piano for two hands, will take place at Austin’s historic Scottish Rite Theater. These distinguished piano artists perform out of their love for classical music and cultural elegance, which they love to share. Join us for an innovative and exciting performance! Originally from Minsk, Belarus, pianist Alena Gorina has earned music degrees from the Belarusian National Conservatory, The University of Texas at Austin, and Bowling Green State University. Today, after a wide range of music teaching positions in Belarus and leading the Piano Department at the Bahrain Music Institute, she teaches at Texas State University. Alena Gorina has performed with many instrumentalists and also served as a piano accompanist for many musical groups. She regularly appears with the San Antonio series, Musical Bridges around the World, which performs a wide range of works and musical styles. Alina Gorina’s solo piano album, Magical Evenings, is available on Amazon.com. In 2013, with pianist Anya Grokhovsky, she organized Duo AleAnya, which recently enjoyed a European tour. 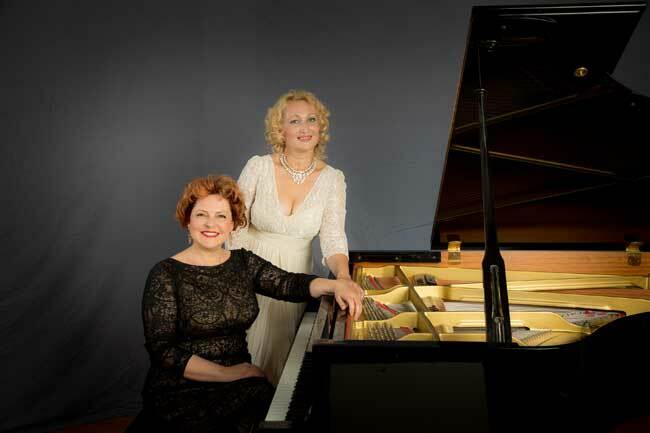 In her free time, Dr. Gorina performs community outreach concerts at schools and retirement homes, both as a soloist and as part of the AleAnya duet. Muscovite Anya Grokhovski is a chamber music pianist from a family of distinguished professional musicians. She received degrees in piano pedagogy and performance from Moscow’s Russian Academy of Music in Moscow, going on to teach at Moscow’s Gnessin State College before coming to the United States. In 1991 she moved to San Antonio to serve as staff accompanist at the University of San Antonio. She has performed with a wide range of international chamber music partners, most recently at the Festival Oldenburg Promenade in Germany, the Boston Conservatory of Music, and Carnegie Hall. As an active and enthusiastic member of San Antonio’s music community, Anya Grokhovski has organized, performed in, and collaborated with many friends and colleagues to bring a love of music to San Antonina’s in many different venues, from private homes to schools to auditoriums and concert halls to the San Fernando Cathedral. This event was made possible by the City of Austin’s Cultural Arts Division, the Texas Commission on the Arts, the National Endowment for the Arts, and Great Promise for American Indians.